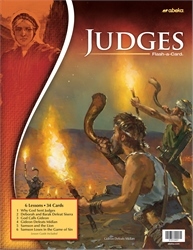 Teach your child about the leadership within the children of Israel with the Judges Flash-a-Cards. These 6 lessons and 34 picture cards depict the stories of the judges from Deborah to Samson. A detailed lesson guide gives you content to teach, prompts for when to use the pictures, and review questions for each lesson. Use these fully colored flashcards to teach your child the importance of obedience.